This stack of platters contains everything from Johnny Rivers doing acoustic pop on a soul oldie to Jimmie Dale Gilmore’s new group swinging through a jazzbo Bob Wills standard. There’s a disc of reggae performances of country songs, as well as a stunning country-rock set by Richie Owens & The Farm Bureau. It will come as no surprise to anybody that Lady Antebellum has the Disc of the Day. “We Owned the Night” will own your ears. It might come as more of a shock to find that hit country writer Dave Berg has a dazzling, unclassifiable and brilliantly produced pop platter up his sleeve. Give that man a DisCovery Award. —This cleanly produced country ballad is an audio pleasure. He sings in a pure heartache tenor, and the band knows exactly when to fill in notes and when to shut up. Which is the mark of true country artistry. —The tingling mandolin notes give way to Charles’s robo cool voice and then to a firestorm of thudding percussion, vocal harmony, rocking guitar and a shout-to-the-heavens melody. Those little yelps of joy don’t hurt, either. In a word, Awesome. —Getting older doesn’t have to be a downer. His old man “might’ve been stronger, faster, younger,” but he’s “never been better.” What a cool attitude, and the rocking track backs it up all the way. —The number 19 is on the high school football star’s jersey. It’s also the age when he dies at war as a hero. Stirring stuff. Billy Ray’s entire I’m American CD is loaded with well written tunes in this vein. Worth your while. 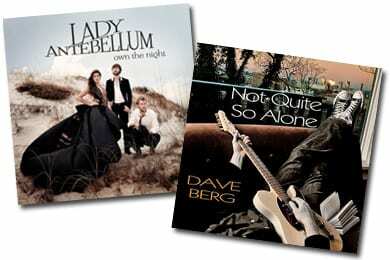 —Top Music Row tunesmith Berg has a new, 14-song showcase titled Not Quite So Alone. It doesn’t contain any of the many hits he has written for others. Instead, it is full of solo-written (gasp!) gems like this pop-ish, rhythmic set opener. The production dazzles and his dry, earnest, folkie vocals are quite engaging. Seek this one out—it is a really refreshing audio change of pace. —The monotonic verses don’t do much for me, but the soaring choruses sure do take off. —Veteran Nashvillians will recall Richie as a valued fixture of our music community of long standing. He’s Dolly Parton’s cousin and has played in her band. He’s also worked with a wide variety of others, including Leon Russell, The Georgia Satellites, Vince Gill, Steve Forbert, Jason & The Scorchers, The Kentucky Headhunters and The Bangles. His new band, The Farm Bureau, tears this folk standard to shreds and reconstructs it as a churning, frothing Americana rocker. By the way, the rest of Richie and his band’s CD is absolutely and equally superb. —Johnny Rivers’s recent visit to Music City included a well-received guest spot on the Grand Ole Opry. His take on this Gladys Knight & The Pips classic strips it down to a swampy, acoustic-based lament. He remains a pre-eminent blue-eyed soul man. —The four words that follow “The Wronglers” on the jacket are “featuring Jimmie Dale Gilmore.” And that’s about all you need to know. The album title tells you the rest, Heirloom Music. The songs are string-band chestnuts performed by this sterling ensemble with the ethereal voice of Gilmore in the lead. Originators include Bill Monroe, The Carter Family, The Delmore Brothers, Charlie Poole, Flatt & Scruggs, Johnny Bond, Doc Watson and, as is the case here, Bob Wills & The Texas Playboys. Old-time music lovers or those charmed by the O Brother sounds, step right up.